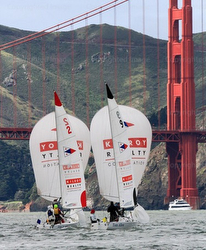 (San Francisco, CA)- The first stop of the annual California Dreamin’ Series, March 9-10 at St. Francis Yacht Club, had racers dreaming of classic San Francisco Bay sailing. 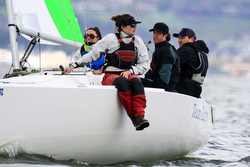 However, two days of rain, variable wind, squalls, lightning and squirrely current didn’t deter local match racing champion Nicole Breault and her team of Molly Carapiet, Karen Loutzenheiser and Hannah Burroughs. 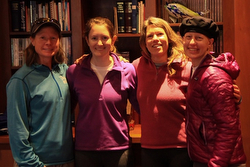 The four women, known as Vela Racing, bested the fleet of eight, scoring 11 bullets in 12 races – losing just once to Breault’s husband, Bruce Stone, and his team of Spencer Paulsen, Stephanie Wondolleck and Halsey Richartz, who finished third overall. Second place was nabbed by Chris Nesbitt, sailing with Drew Guay, Michael Nicoletti and Kara Voss. Stone credited his win over Breault and his Day 2 picket fence to “risk minimization,” sailing away in the pre-starts as he observed the other competitors getting to the line too early in the flood tide. The strategy boosted him to a podium finish. Principal Race Officer Jeff Zarwell was profuse in his thanks to the umpires, who hailed from throughout the West Coast and Canada, and the race management team who endured challenging mark sets in unpredictable currents caused by the freshwater run-off of recent rains coursing over the saltier flood tide. “We hadn’t even gotten to max flood and it was already ebbing,” he exclaimed on the second day, which delayed mark-setting for some of what turned out to be the final heats when the wind shifted and then died and lightning spiked across the Bay, putting an early end to racing. The California Dreamin’ Series brings together eight teams from around the US to compete in a double round-robin format. The next stop will be at San Diego Yacht Club on October 5-6, 2019, followed by Long Beach Yacht Club on November 2-3, 2019. Sailing photo credits- Chris Ray For more J/22 California Dreamin’ sailing information Add to Flipboard Magazine.